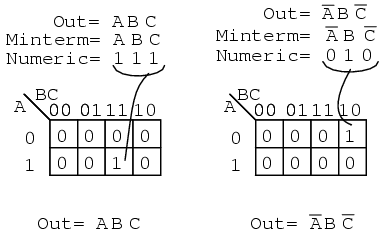 A minterm is a Boolean expression resulting in 1 for the output of a single cell, and 0s for all other cells in a Karnaugh map, or truth table. If a minterm has a single 1 and the remaining cells as 0s, it would appear to cover a minimum area of 1s. The illustration above left shows the minterm ABC, a single product term, as a single 1 in a map that is otherwise 0s. 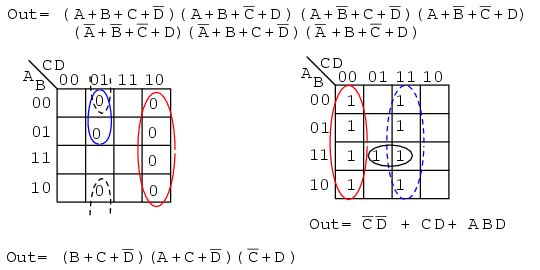 We have not shown the 0s in our Karnaugh maps up to this point, as it is customary to omit them unless specifically needed. Another minterm A'BC' is shown above right. The point to review is that the address of the cell corresponds directly to the minterm being mapped. That is, the cell 111 corresponds to the minterm ABC above left. Above right we see that the minterm A'BC' corresponds directly to the cell 010. A Boolean expression or map may have multiple minterms. 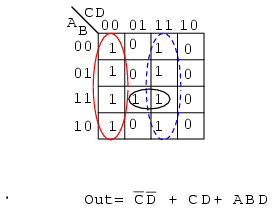 A Boolean expression will more often than not consist of multiple minterms corresponding to multiple cells in a Karnaugh map as shown above. The multiple minterms in this map are the individual minterms which we examined in the previous figure above. The point we review for reference is that the 1s come out of the K-map as a binary cell address which converts directly to one or more product terms. By directly we mean that a 0 corresponds to a complemented variable, and a 1 corresponds to a true variable. Example: 010 converts directly to A'BC'. There was no reduction in this example. Though, we do have a Sum-Of-Products result from the minterms. Another maxterm A'+B'+C' is shown above. 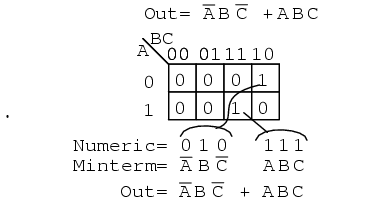 Numeric 000 corresponds to A'+B'+C'. The complement is 111. Place a 0 for maxterm (A'+B'+C') in this cell (1,1,1) of the K-map as shown above. Why should (A'+B'+C') cause a 0 to be in cell 111? When A'+B'+C' is (1'+1'+1'), all 1s in, which is (0+0+0) after taking complements, we have the only condition that will give us a 0. All the 1s are complemented to all 0s, which is 0 when ORed. A Boolean Product-Of-Sums expression or map may have multiple maxterms as shown above. 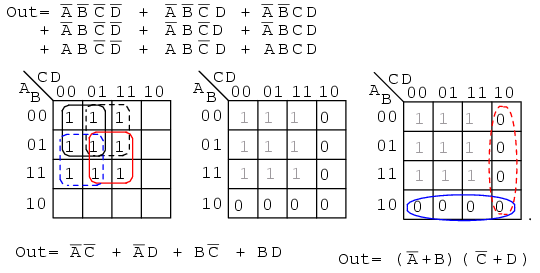 Maxterm (A+B+C) yields numeric 111 which complements to 000, placing a 0 in cell (0,0,0). Maxterm (A+B+C') yields numeric 110 which complements to 001, placing a 0 in cell (0,0,1). Now that we have the k-map setup, what we are really interested in is showing how to write a Product-Of-Sums reduction. Form the 0s into groups. That would be a group of two below. Write the binary value corresponding to the sum-term which is (0,0,X). Both A and B are 0 for the group. But, C is both 0 and 1 so we write an X as a place holder for C. Form the complement (1,1,X). Write the Sum-term (A+B) discarding the C and the X which held its' place. In general, expect to have more sum-terms multiplied together in the Product-Of-Sums result. Though, we have a simple example here. 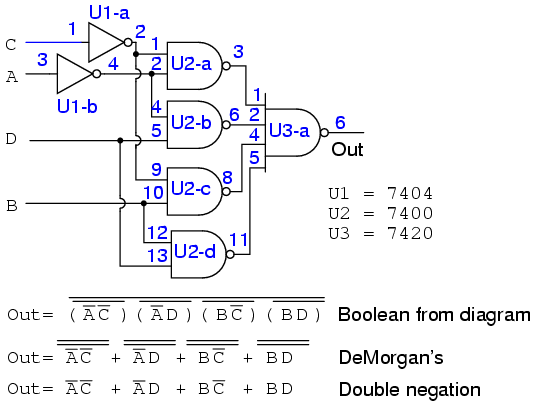 Above right we see that the output NAND gate with inverted inputs is logically equivalent to an OR gate by DeMorgan's theorem and double negation. 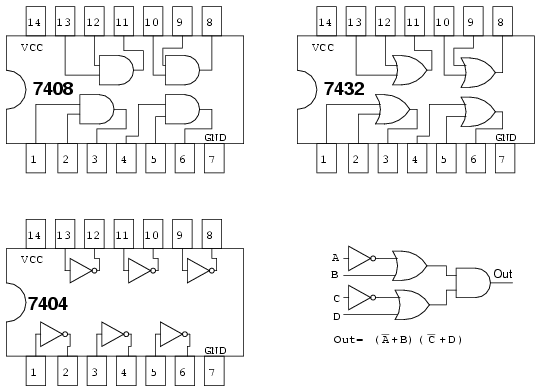 This information is useful in building digital logic in a laboratory setting where TTL logic family NAND gates are more readily available in a wide variety of configurations than other types. We can now build this circuit in a laboratory setting. Or, we could design a printed circuit board for it. A printed circuit board contains copper foil "wiring" backed by a non conductive substrate of phenolic, or epoxy-fiberglass. Printed circuit boards are used to mass produce electronic circuits. Ground the inputs of unused gates.